Little Common secured the Macron Store Southern Combination Football League Division One title in style with their biggest win of the season. 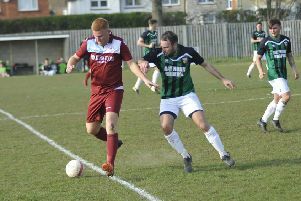 The Commoners needed only to avoid a six-goal defeat in their final game at home to Billingshurst today (Saturday) to be crowned champions and they did far better than that with a crushing 8-0 victory. Little Common player-manager Russell Eldridge, captain Lewis Hole and Chris Eldridge with the club's two trophies. Lewis Hole scored a hat-trick to finish top of the division’s scoring charts, Russell Eldridge bagged a brace, and one each from Paul Feakins, Stuart Collier and Wes Tate completed the rout against a third-bottom Billingshurst side playing its fourth match in eight days. The game got off to a dramatic start, with both teams very close to scoring in the opening three minutes. Hole had a shot brilliantly cleared off the line by Billingshurst defender Tom Bradshaw before Nick Tilley headed against the post at the other end. Common took the lead after 10 minutes. Louis Walker played a good ball over the top of the away defence and Eldridge, who had made a great run beyond the forwards, controlled the ball well with his first touch before finishing clinically with his second. Hole glanced a neat header into the far corner from an Eldridge cross only to be denied by the offside flag, but he did get one to count moments later in the 25th minute. Harry Saville played a decent ball through and Hole slotted past away goalkeeper Liam Matthews. Little Common full-back Ryan Paul tries to get a block in. Ten minutes later it was 3-0. Moments after Saville burst through the inside right channel and had a shot saved, Hole rose highest in a crowded penalty area to head home an Eldridge corner. Hole completed his treble in the 41st minute with the goal which took him past Langney Wanderers hot shot Wayne Wilkinson to be the division’s top marksman. Tate played a delightful little pass through for Hole to guide the ball beyond Matthews. Although the game was well and truly won by half time, Common didn’t take their foot off the pedal in the second period. They dominated possession and played some good football, and when they lost the ball, they worked hard to frequently win it back quickly. Tate had a shot saved following some wonderful close control in the box and the fifth goal arrived soon afterwards in the 57th minute. Tate played a great ball to release Ryan Paul on the right and his cross was guided home by Eldridge with a sweetly-struck first time finish. Little Common pair Louis Walker and Charlie Bachellier combine to crowd out Billingshurst player Jamie Bennett. Paul had a shot saved by Matthews following another terrific ball from Tate, who was denied by the goalkeeper when one-on-one a couple of minutes later. Paul then powered a header against the crossbar from an Eldridge corner. Common goalkeeper Matt Cruttwell made his only real save of the afternoon, from a Fred Bowles free kick, before goal number six arrived in the 79th minute. Paul Feakins showed tremendous footwork to step past a pair of defenders before rolling the ball past Matthews. Billingshurst’s afternoon went from bad to worse when they were reduced to 10 men in the 82nd minute. James Powell was shown a straight red card for swearing at the referee. Common were awarded a penalty a minute later when Lewis Parsons was unceremoniously bundled over in the box by Nathan Sleat. Regular penalty taker Tate stepped aside to give Eldridge the chance to complete his hat-trick, but Matthews made a good save low to his left. Little Common midfielder Harry Saville closes down a Billingshurst opponent. Parsons headed onto the top of the net from a Stuart Collier corner before Common added a seventh goal in the 89th minute. Collier went through on goal and coolly dinked the ball over Matthews into the corner of the net, much to the delight of the Common bench. There was still time for one more in the first minute of added time. Tate was tripped by Bowles just inside the box and this time took the penalty himself, driving it high into the net down the middle. After the game Common were presented with the league winners’ trophy - their second piece of silverware in four days having lifted the Division One Challenge Cup on Wednesday night. Common: Cruttwell, Paul, Walker, Eldridge (Collier 85), Maynard, Parsons, Bachellier, Saville (Feakins 71), Hole, Tate, Smith (Harley 58). Subs not used: Ammoun, Smith. Southern Combination League Division One top half final standings (all played 34 matches): 1 LITTLE COMMON 85pts (+80 goal difference), 2 Langney Wanderers 82 (+66), 3 Lingfield 79 (+68), 4 Ringmer 64 (+31), 5 Wick 61 (+31), 6 Mile Oak 56 (+14), 7 BEXHILL UNITED 55 (+20), 8 Hailsham Town 49 (-1), 9 Selsey 47 (+2).